Cabling is the longest life cycle component of your entire network. A standards compliant cabling system can "future proof" your network and guarantee future application support, ensuring that your investment will continue to serve you for the full extent of its life cycle. There is a lot more to cabling system performance than just buying good quality cable and connectivity hardware. In order to ensure full bandwidth potential, a structured cabling system needs to be properly designed, installed, tested and administered. Information technology is at the heart of today's successful business operations. Efficient integration of all key areas - from research and development through customer service - is of critical importance. While businesses function with their own requirements, are all dependent on one common technological foundation: cabling. A cabling system is only as good as its design, installation, testing and administration. Each area is highly specialized and requires trained professionals to ensure true category performance. Advanced certified installers provide the necessary link between cabling products and installations that are compliant with national and international telecommunications standards. Venture Communications & Security is the network cable installation company you can trust with any major project! What's hiding in your closet?! Complete Solutions for Copper & Fiber - Network Design, Installations, Upgrades, Testing, Documentation, Maintenance, Re-Location, etc. Cable & Wire Installations for Phone Systems, Security Systems, Alarm Systems, etc. • UTP Patch Cables/Patch Cords - Unshielded Twisted Pair (UTP) Patch Cables and Patch Cords are used to connect two nearby components, such as a PC to a wall outlet, or a patch panel to a hub. - Used to connect two nearby components with fiber connectors, these Cables transmit data with light, so you don't have to worry about electrical interference. • UTP Horizontal Cables - These Cables are made from solid-conductor wires and typically used for in-wall premise installation. We provide high-quality Category 5e and Category 6 horizontal cables. • RJ45 Plugs - RJ45 Plugs are used to make UTP Patch Cables. We carry Plugs with both flat and round entrances, for making flat cables and rounded UTP cables. • Jacks - We offer a vast selection of jacks, so you can complete and customize your networking outlets. • Outlets and Faceplates - Our outlets provide the perfect combination of insert and faceplate features. They are the hardware you need to interface patch and horizontal cables. • Inserts - We carry a full array of inserts for all your networking needs. They snap easily into a faceplate, to make your workspace network-ready. • Patch Panels - We carry a variety of patch panels, featuring from 12 to 96 ports. We provide everything you need to set up a manual switching center for incoming and outgoing telecommunication and electronic lines. • Racks & Cabinets - We offer a wide range of racks and enclosures to store, secure, and organize your data and voice equipment. They help ensure that your devices run effectively and efficiently. 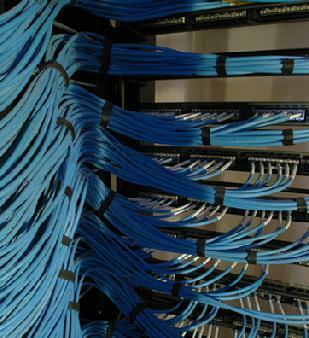 • Cable Management - We provide various types of cable Management. From a 19-inch rack-mountable panel for racks and cabinets, to simple cable ties, we have the best ways to keep your network organized and your cables optimally arranged. • Raceways - Our Raceway systems protects and conceals networking cables while eliminating the need to run cables behind the wall. 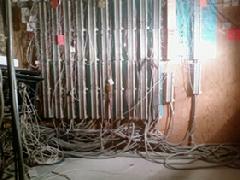 The National Electrical Code requires that all abandoned copper and fiber cable be removed. Literally, miles of cabling left in the ceilings and in the walls from previous network and power installations by previous tenants have accumulated in most of our buildings. These abandoned cables are a source for fueling fire, smoke lethal toxic fumes that can incapacitate and kill. The Code states "...The accessible portion of abandoned communications cables shall not be permitted to remain..."
Abandoned wires may render your property out of code, jeopardize your fire insurance and represent a significant legal liability. The new rules make it a violation to have abandoned wires in your building's risers or plenums and mandate the use of specific wiring standards for new installs. Why does abandoned cable present such a problem? The accumulation of miles and miles of cabling left in the ceilings and walls of facilities has become a major concern for life safety over the past 10 years. Cables abandoned in ceilings, riser systems and air-handling systems are a source for fueling fire, smoke and lethal toxic fumes and can incapacitate, even kill. PVC jackets tend to break down over time. This decomposition process is accelerated by exposure to increased temperatures and humidity. The new NEC rules are complex and often confusting, causing building owners to wonder which way to turn. Venture Communications & Security LLC has the knowledge and expertise to guide you through this murky area of danger and liability. Our highly skilled technical staff can perform the identification and removal task according to code - very economically. We support the efforts of each building owner to amend leases and residential rules so the building remains in compliance after each tenancy. In support of commercial tenants/occupants, we provide technical expertise and cabling installation / removal services which are fully compliant with NEC requirements - and can avoid end of lease penalties. Abandoned cable is commonly found in hospitals, schools and office buildings that were built many years ago, then expanded in recent years. Particularly vulnerable and in need of urgent corrective action is the healthcare industry, where abandoned cables abound and safety concerns are a high priority. As building owners embark on the mandated clean-up effort, we, as a premiere cabling company, strongly feel the obligation to reduce the financial impact of bringing buildings into compliance. Ripping out and throwing away cable no longer in use would be easy for the contractor, but is an unacceptable waste for the building owner. The smart, economical solution is: test it, tag it "for future use" and convert a potential liability into a building asset.